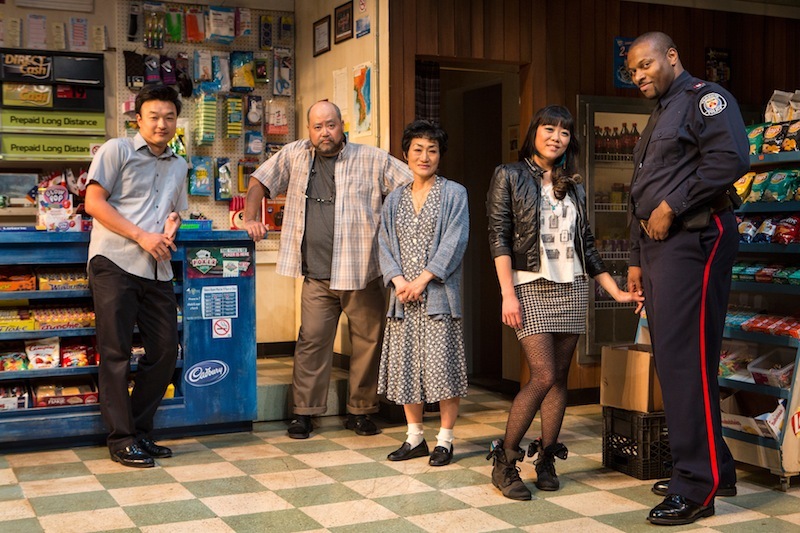 My only regret about seeing Kim’s Convenience at the NAC last night was that I didn’t go earlier in the run and have greater opportunity to plug this SoulPepper Theatre production by Ins Choi. Initially a vignette Choi was encouraged to grow Kim’s Convenience to a full length play which went on to win the Fringe Festival New Play 2011 and is now on a National tour. Set in a Toronto convenience store the story of what will become of the family business as Mr Kim (the remarkable Paul Sun-Hyung Lee) nears retirement goes deeper exploring generational and personal expectations and the power of acceptance. Kim, his wife (Jean Yoon) and daughter Janet (Grace-Lynn Kung) reveal distinctly personal desires despite living in the close confines above the small shop creating resonant characters that ground the production from the outset. The writing and directing are crisp transitioning the audience smoothly from Kim’s banter with Janet, his hilarious lessons in shop management and customer interactions to a breathtakingly tender moment when prodigal son Jung (Choi) joins his mother “Umma” (Yoon) in song. While several plot developments unfold at unrealistic speed the overall needs of the straight-forward narrative make this an acceptable weakness. The ensemble cast including the outstanding Lee (Best Actor in a Play 2012 – Toronto Theatre Critics Award) maintain a rhythmic balance between drama and comedy that captures the audience and brings a polished delivery to the simple production. Lee and Hung are wonderfully cast as father-daughter and their delivery is a complex dance of love and conflict. Andre Sills takes on multiple characters convincingly while Yoon is memorable in her small yet poignantly touching role. Together the cast shine in a simple yet universal play on difficult family dynamics, love, sacrifice and a transforming urban landscape. This production is a captivating example of the power and accessibility of live theatre when well timed comedic writing is encompassed within compelling story-telling & supported by pitch perfect performances.